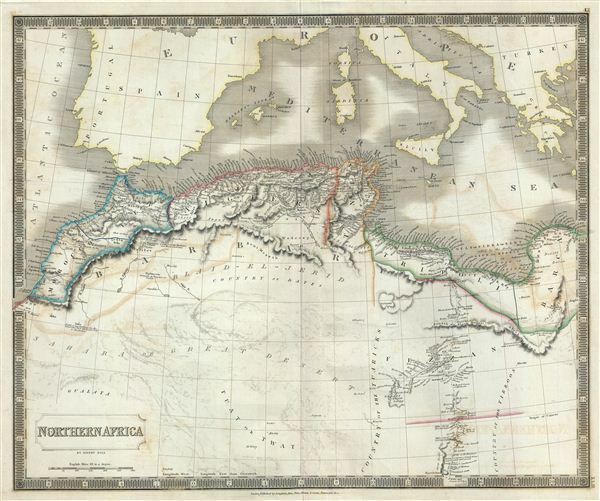 This is a beautiful map of northern Africa from Sidney Hall's extremely scarce 1835 New General Atlas. It covers the Maghreb or Barbary Coast and the western Mediterranean Coast of Africa from Morocco to Tripoli, including modern day Morocco, Algeria, Tunisia and Libya. The map focuses on Morocco and the Mediterranean regions of Fez, Algeria, Tunisia and Tripoli and the ancient Greek and later Roman, Byzantine colony of Barca. It also shows the inland oasis Kingdom of Fezzan. Though mostly desert, 19th century Fezzan had numerous oases and supported a relatively large population. This desert kingdom was a critical stopping point for trade caravans crossing the Sahara since antiquity. This important still active caravan route, with its string of Oases, is mapped out in some detail. The Tuat, a vast desert region, marked with numerous oases is also noted. The desert area is largely unmapped, simply identified as 'Blaid-el-Jerid, Country of Dates.' The map offers various interesting annotations, such as 'Point of assemblage for the caravans that are to proceed to Timbuctoo' at Tatta and 'Station for the Timbuctoo and Mecca caravans' at Fighig. Parts of North Africa, at the time were under the influence of the rapidly declining Ottoman Empire. The region would go on to be colonized by France, United Kingdom, Spain and Italy during the next century. Rumsey 4224.043 (1830 edition). Tooley, R.V., The mapping of Australia and Antarctica, 2nd ed., p. 92-93, no 687. Philips (Atlases) 758. National Library of Australia, 2113921; MAP F 514; MAP NK 10750/1; MAP RM 741; MAP T 687. Ristow, W., American Maps and Mapmakers: Commercial Cartography in the Nineteenth Century, p. 303-09.